Welp, Christmas is tomorrow and I'm ready for it to get here! I did almost all my shopping during Cyber Monday and finished yesterday at ToysRus, wrapped the presents at work, and had enough time to hide the gifts. I'm glad I gotten all my Christmas shopping done early this year because after my trip to New Orleans I fell ill and my sickness lasted for over a week which would have made me miss days of shopping. This year, I told the girls that Santa will not be getting a lot for them for Christmas because we are moving in January and I don't want to be loading a whole bunch of stuff to our new place and plus they have plenty of stuff. I've already been donating a lot of their toys and clothes, I need to be having a "Shop The Girl's Closet" on this blog, LOL! SERIOUSLY! 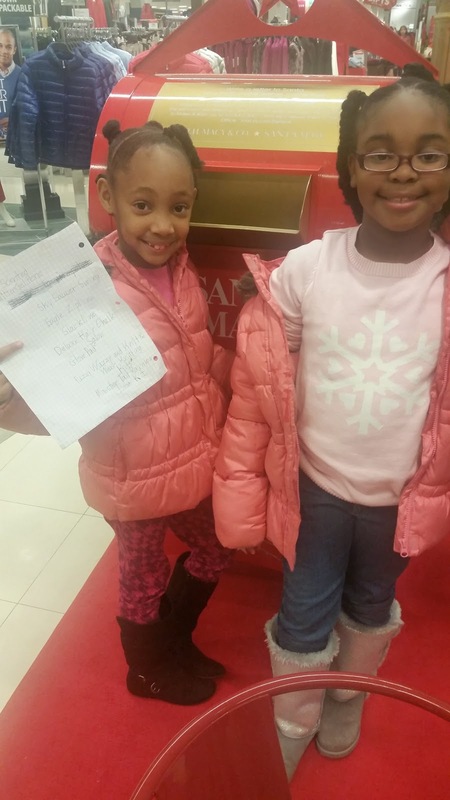 The girls dropped off their Christmas Wish List at Macy's Santa drop box. As for what is on my Christmas list? Nothing. I usually don't ask for anything for Christmas, I use Christmas day for my daughters. After Christmas, we take our annual family vacation to Orlando. I allow my daughters to choose which amusement park they would like to go to and this year they chosen Sea World. I'm looking forward to bringing in the new year in style! Make sure to follow me on Instagram! Wow, Santa was good to the girls this year....I can't wait to see the pics! They won't get everything on their list but Santa will get them enough. Shopkins are very small and I can see me stepping on those things and then hollarin'!!!! LOL! Thanks girl, I love seeing pics of your angels as well, too bad we don't stay close to each other to do play dates.